Home » Accounting Dictionary » What is Debt Financing? Definition: Debt financing is the process of raising money in the form of a secured or unsecured loan for working capital or capital expenditures. Firms typically use this type of financing to maintain ownership percentages and lower their taxes. What is the definition of debt financing? Debt financing is borrowing money from a third party, i.e. a financial institution, with the promise to return the principal with an agreed interest. Startup companies and smaller firms use debt as a way to leverage their operations and maintain ownership of their business. The greatest advantage of financing with is the tax deductions, as in most cases, debt related interest payments is viewed as a business expense on the firm’s balance sheet. On the downside, an increase in the interest rates will have an impact on the loan repayment and on the credit rating of the borrower. Also, the firm uses its assets as collateral for the loan to obtain a higher line of credit; thereby, in the case of a default, the borrower may be required to repay the remaining loan and interest in cash. Dennis owns a pizza restaurant, and he has been in business for 15 years. Over the last few months, Dennis considers expanding his business. So, he meets with a loan officer in the nearby bank to discuss the potential of financing with debt to leverage his business operations and increase efficiency. 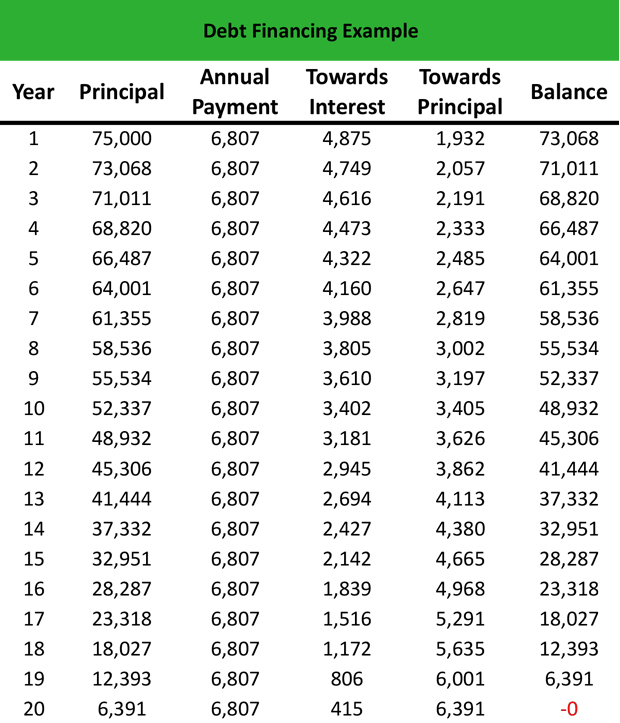 The loan officer suggests that Dennis gets a loan of $75,000 for 20 years at 6.5% interest rate. So, Dennis will have to pay $6,807 annually for the next 20 years. To secure the loan, the loan officer asks Dennis to put the restaurant assets as collateral and agree that in case his business defaults, he will repay the bank in cash. Financing with debt is a relatively expensive way of raising funds because the company has to involve a third party in the equation and structure a high line of credit in a systematic way to finance its operations. On the other hand, it leverages a business without using own funds. Define Debt Financing: Debt financing means acquiring the funds to purchase an asset or expand company operations by taking out a loan. 1 What Does Debt Financing Mean?